How do teachers create a classroom environment that promotes collaborative and inquiry-based approaches to learning ballet? How do teachers impart the stylistic qualities of ballet while also supporting each dancer’s artistic instincts and development of a personal style? How does ballet technique education develop the versatility and creativity needed in the contemporary dance environment? Creative Ballet Teaching draws on the fields of Laban/Bartenieff Movement Analysis (L/BMA), dance pedagogy, and somatic education to explore these questions. Sample lesson plans, class exercises, movement explorations, and journal writing activities specifically designed for teachers bring these ideas into the studio and classroom. A complementary online manual, Creative Ballet Learning, provides students with tools for technical and artistic development, self-assessment, and reflection. 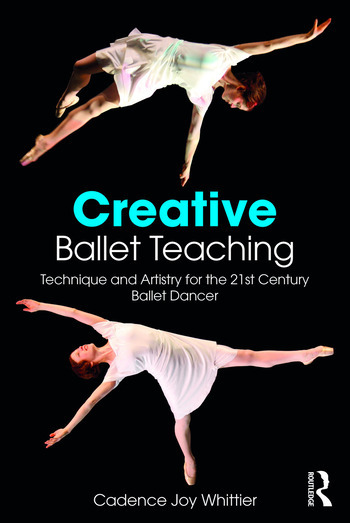 Offering a practical, exciting approach, Creative Ballet Teaching is a must-read for those teaching and learning ballet. Cadence Joy Whittier (MFA, CLMA, RSMT) is Professor of Dance at Hobart and William Smith Colleges, New York, and Faculty and Co-Director of Laban Movement Analysis/Bartenieff Fundamentals Certification Programs at Integrated Movement Studies.